Courtesy of Kimimi from Kimimi's blog (thanks!) we have a translation of the Puyo Puyo Tsu Perfect Set card! Each section has been numbered on the scan on the left, so you'll know which bit's being translated. However, this isn't a word-for-word translation- in her own words, it's more like 'The text says something like...'. 1) The arcade version of Puyo Puyo was released two years after being announced. A maximum of four people are able to compete, it was popular to the extent that arcades had competition tables. '2' and 'Tsu' had a similar sort of presence too. Released quietly on the MSX and Famicom, the later upgraded ports for the arcade and Mega Drive were [Compile's] big break and Puyo Puyo's second series is considered a historical puzzle masterpiece. When all is said and done, Tsu is the game with the most drastic changes to battles. Before, the first player to clear a chain had an overwhelming advantage, but now the other side had the 'counterbalance' rule applied. That's all there was to it (obviously there was some fine-tuning too), but truth be told that's the crux of Puyo Puyo competition. Since then the series continued on for four more entries, but nothing improved on 'Tsu', even the newest game 'Fever' had to gather ideas and take the concept down a new path. 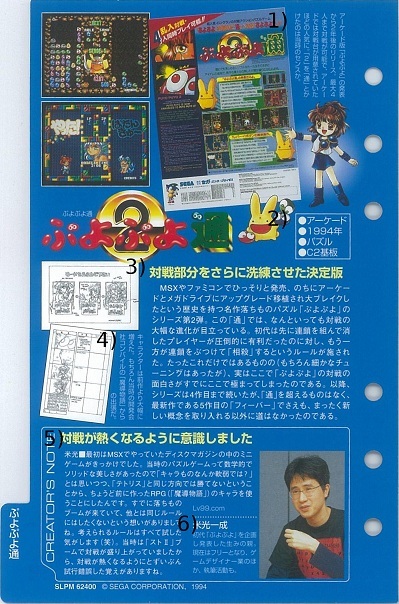 Yonemitsu: In the beginning I had the chance to work on various minigames for the MSX disc magazine. At that time puzzle games were mathematical so while working I thought 'Why do these games have such weak characters? ', it wasn't possible to beat Tetris just by doing the same thing, so I decided to use the characters from our previous RPG 'Madou Mongatari'. With this defining point already in place, I thought that other [puzzle game] rules don�ft have to be the same either. I tried out every single rule I could think of (laughs). At that time 'Street Fighter II' had made competitive games very popular, I remember a lot of trial and error to get that same feeling [in Puyo Puyo]. Founder and designer of the 'Puyo Puyo' series. Currently freelance game designer and writer. Oh no, the layout's gone all weird! Aaah!